EcoClean Dinner Bell Review & WBU Giveaway! 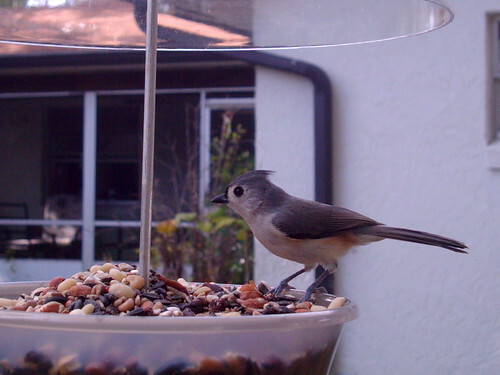 Since moving house in June, I’ve been trying to get the hang of back yard bird feeding here in Florida versus what I was used to in northern Illinois. I made the mistake of keeping unsealed bags of bird seed in the garage (hello meal moths), of offering nyjer bird seed in summer (no takers), and of using uncovered feeders in the rainy season (leading to a wet block of spoiled seed). I’ve gotten rid of the moths but I’m still working on using different feeders to offer appropriate seed to the regulars. 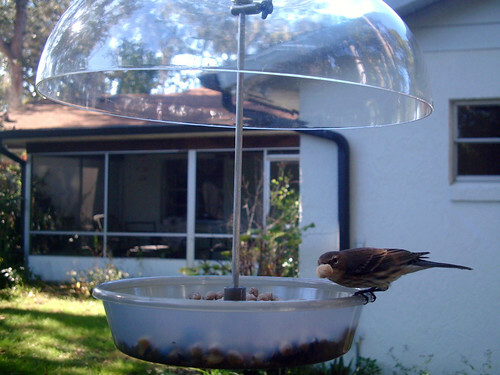 The EcoClean Dinner Bell Feeder from Wild Birds Unlimited is just what I need in our yard now. 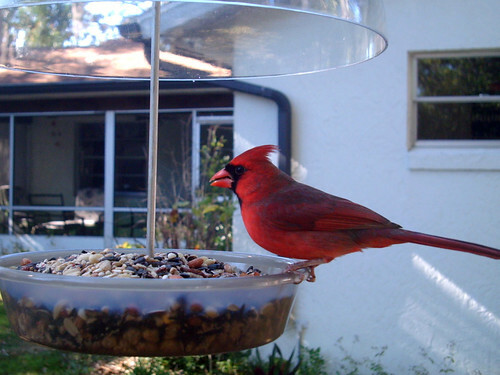 The small open feeding tray is covered with a sturdy, over-sized, clear plastic dome. The dome can be raised or lowered depending on the type of birds you’d like to attract. I’ve left it about as high as possible to offer the contents to any bird who wishes to visit. The dome protects the seed from the elements, which means the seed stays fresh longer when it rains. The tray has small drainage holes, which would be especially handy in case I ever decide to use the feeder without the dome. Click any photo for a larger view. The EcoClean Dinner Bell is sold disassembled; assembly was extremely easy and only involved screwing the dome and the tray onto the metal wire. This feeder came with a bag of Bark Butter Bits, which I have been offering along with some other general wild bird seed. 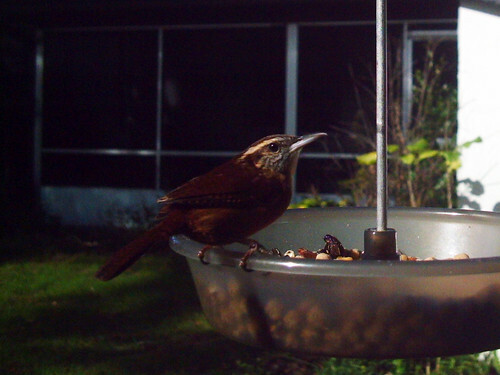 Bark Butter Bits are small suet balls (kind of like Dippin’ Dots for birds!). Bark Butter is known to attract over 100 species of bird (wow!) 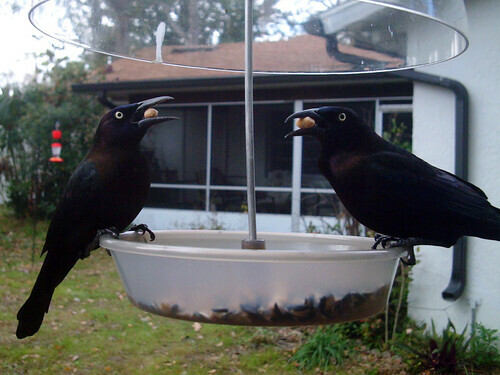 and these little balls of suet are perfect to offer a small amount to our small-but-growing group of back yard birds. According to WBU, the EcoClean products “feature a patented technology that inhibits the surface growth of damaging bacteria, mold and other microbes. This protection won’t wash or wear away, and it uses environmentally friendly technology.” This means that there’s no need to use bleach when cleaning this feeder. And cleaning is a breeze with this open feeder. While it’s extremely easy to completely disassemble the unit for cleaning, it’s not really necessary with such an open-style feeder. In addition to providing me with the feeder-bark butter combo for review, WBU has generously offered my blog readers the chance to win a product of choice (valued up to $50) from their great catalog of back yard birding supplies and gifts. 2. Get one extra entry by becoming a fan of Wild Birds Facebook Page. Leave an additional comment on this post to let me know you’ve done this. 3. 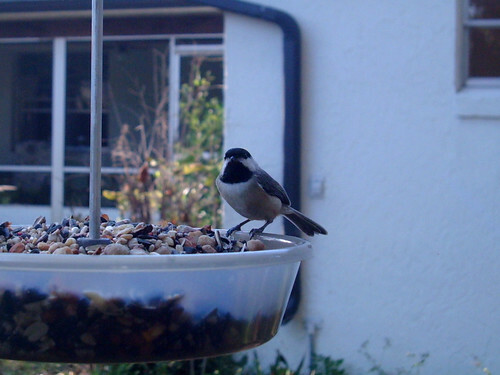 Get one extra entry by signing up for the Wild Birds Unlimited Newsletter (sign up in the sidebar box here: http://www.wbu.com/). Leave an additional comment on this post to let me know you’ve done this. This contest is open to anyone with a U.S. address. The winner will be picked via random drawing next Tuesday, December 20th, so all entries must be received by 11:59PM EST on Monday, December 19th. Good luck! Even if you don’t win, visit http://shop.wbu.com for great holiday gifts! For standard shipping, place your order before 9AM PST for holiday delivery. I’ll leave you with a Wingscapes BirdCam image of the very first visitor to my EcoClean Dinner Bell: a Carolina Chickadee – keeping dry along with all that seed in the rain! Birders were excited when John James Audubon’s 226th Birthday was commemorated with a Google Doodle on April 26, 2011. Hundreds of Google Doodles are now available on t-shirts, mugs, and other gifts, on Zazzle.com, the Audubon doodle included! It isn’t available on the complete Zazzle product assortment, which is too bad, because I think it would be suited for things like Zazzle’s custom binders, rectangle stickers, and iPhone cases, but it’s still available on some cool things. The design has a white background, but you can use Zazzle’s customization tools to make the white parts of the image transparent on the canvas print, so you can make a plain white background a bit more interesting. I added a light yellow wash to the example below. Unfortunately the customization has been turned off on the apparel and other products, but they have picked out suitable shirts for this design. Coincidentally, I’ve just added a bunch of vintage Audubon print work to the MagnificentFrigatebird shop. They are in the Historic Bird Illustrations section. Everything here is totally customizable, so feel free to play around with backgrounds, changing product styles, and adding your own text or images!